What a long weekend!!! Saturday was Mardi Gras. The Dragons were out in force promoting the club. We had a stall which gathered lots of interest (albeit, a lot was about Amos’ sheep!!) We also had a friendly kick about with people outside, with Christian conceding a lot of goals against a 2 year old!! We had an amazing 30 people sign up for more information about the club and to show an interest in coming along to training this Sunday. Hopefully most will come along and it would be great if all of us are there to show them what the club is about. You never know, one of them could be the next Ronaldo!! A massive thank you to John B, Jordan and everyone who helped out on the day. Sunday saw us travel up to Leicester for the annual Leicester six a side tournament. Both teams applied themselves well and were unlucky not to make it out of their groups. A big thank you to all those who travelled, especially the drivers, many of whom were out on the Saturday at Mardi Gras. See football news for more details. Over the next few weeks we will be looking to get player profiles for the website. Jordan plans to start taking photos for these at Sundays training session so make sure you make yourself look pretty!! Over the coming weeks, we will be looking to revamp the weekly email. What would you like to see? How would you like it set out? Please send your thoughts to myself ( secretary@cardiffdragonsfc.co.uk ) All comments are welcome. This weekend sees the first Dragons Open Day, where potential new members will be invited to come and meet us at Pontcanna for training. 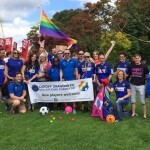 Following Saturday’s Mardi Gras, we took around 30 new contacts so hopefully a few will be able to come and join us. Dragons Red – The Reds were unfortunate not to progress from their group of 6 with 2 wins, 1 draw and 2 losses from their 5 games missing out by 1 point to finalists Nottingham who’s 1-0 victory over us proved crucial. The Reds however created many opportunities scoring 5 well worked goals in their final 3 games scored by Mark (3), Anthony and Crispin with a fine turn and shot for his debut goal. Dragons Blue – In a very tough group the Blues battled hard throughout to gain 2 draws against Leicester Reds and Bristol but fell short of progression. This however was an improvement from last year in terms of points gained and also in the number of goals conceded, only 5 in their 6 games. A valuable experience and learning curve for all those involved. Last November, The Dragons historically won their first ever GFSN League match in Brighton, 1-0 against the Bandits. After a tough summer which nearly saw the exit of Brighton Bandits from the GFSN League, The Bandits are back and will be out for revenge, looking to overturn last years result. This seasons meeting promises to be a fascinating encounter whether playing or supporting. Please could everybody fill out an availability form if they wish to play and make your decisions on your plan for the day early in order to help things get organised. 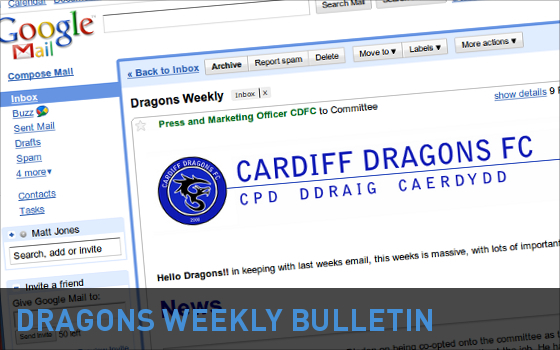 An availability form is attached and should be returned to Murray (footballmanager@cardiffdragonsfc.co.uk). This match sees the first meeting of Cardiff Dragons and Exeter Lions and the first of our 4 South-West League fixtures. Exeter will be looking to carry on their good form after recently beating Trowbridge Tigers 2-1 in the GFSN Cup. This match will be a development match for The Dragons and we will be giving everybody the chance to play competitively. Last week I said that this match was at home, it is actually away, a new form is attached or drop Murray a line to confirm you are still available. This is an alternative to the Go-Ape (which is quite expensive but details below) and will provide great team-building opportunities. This is an indoor venue just off Newport Road. The plan is to go down in the afternoon and it will cost about £12 per person – Details TBC closer to the time. The last time we went bowling we had a great time; this is a fun and relaxed evening. Details and times will be confirmed closer to the time and we will book an alley (or 2). If you are interested please let me know so we can gauge interest. Jason Cousins (Local GFSN Regional Representative) will liaise with the GFSN and try to organise an official GFSN event where hopefully we can get some regions down to visit us; this will be great as we will get to see some familiar faces and show everyone how friendly us Welsh are and a good time!!! This is likely to be for the October qualifiers. Keep an eye out for communications on this; as soon as we hear back from Jason/GFSN you shall be informed. This can go ahead if you wish but we need your commitment if this is to go ahead. Having researched into this and it costs £30 per person and would be a perfect team building opportunity. The only thing is that they need full payment upon booking and they cannot give us a date until we book. If you would like to go please let me know but note we will require full payment before we book and it is only then that we would be able to supply a date; as you can see there are complications around confirming this event but I am willing to go ahead with it if there is enough interest/commitment shown. Firstly I’d like to thank all members for taking part and attending the recent Player Auction and Mardi Gras activities. So far we have manged to raise £480.08 since I took on the post. Dave Keith has provided a break down of what what we have achieved. Car Boot £54.50 Easyfundraising £19.61 May Lotto £9.00 June Lotto £11.00 Jul/Aug Lotto £8.50 Aug Fundraiser £377.47 Total raised = £480.08 25% of this will be going to THT. Dave Keith has written a cheque to them for £120.02 which he will be sending shortly. There is a committee meeting next week. I have asked Dave Kelly to agenda spending as an item. I will be taking the results of the fundraising questionnaire that was emailed to you all a few weeks ago so that we can identify areas where money raised can be spent. With it being an International week no change in then fantasy football this week. This year we have also set up a Championship Fantasy Football League. Currently topping the table is Jason C although it is tight at the top with just three points separating the top three. Go to fantasy.football-league.co.uk, enter a team and then join the Cardiff Dragons FC league, pin is 834.